Split off from viewtopic.php?f=76&t=152425&start=0 in order to avoid that thread becoming a circular repetition of arguments. 13.06.09 Thread moved to this section and parent thread moved to what-if section as originally intended. Jon - I, and any readers of this thread, will have to conclude that you simply CAN'T answer them, or the facts that BOTH the Central Med in-theatre operations AND the through-traffic success of the Royal Navy prove you wrong. There ARE no other Fliergerkorps X' sinkings, nor convoys disrupted/sunk/turned back. Feel free to take your ball and go home. Though it's disappointing. Re: Are these two "What If" theories overly simplistic? Phylo, I have given you chapter and verse of how, what and when the closure of the central Mediterranean meant. It is not my problem that you cannot - will not - understand the difference between Malta resupply operations and through-going traffic in the central Mediterranean basin. If I can't make my point come across even after I've reached for the crayons, then I can't help you. It is not my problem that you cannot - will not - understand the difference between Malta resupply operations and through-going traffic in the central Mediterranean basin. Nor is it MY problem that I've shown that the British were successful at doing BOTH in the timeframe YOU selected, Fliegerkorps X' deployment in Sicily. No - you've repeatedly tried to limit the meaning to just what YOU want. Without reposting it all over again, I produced a considerable number of successful and unmolested-by the-Luftwaffe RN fleet operations in, out and around the Central mediterranean in that same timeframe. AND showed that the Luftwaffe even failed at what you said they succeeded at - closing the Central Med to through traffic. Frankly, Jon, it is similarly amusing to see you ignoring that I've proved that even your "through-going traffic" definition was wrong as well - with both TIGER and EXCESS making it through successfully during the Fliegerkorps X deployment. You can keep up this going round in circles all night - but it doesn't contradict the fact that the historical timeline and events prove your proposition wrong on EITHER definition. You are insulting my intelligence, phylo. 1) I've made allowance for the Tiger convoy throughout. Do not pretend that I haven't. 2) Excess was a Malta-bound convoy which subsequently moved east from Malta. The parts of it that could still move, anyway. That Excess was Malta-bound shows us - well, maybe not you, I don't care anymore - that it was not a through-going convoy. Excess was a Malta-bound convoy which subsequently moved east from Malta. The parts of it that could still move, anyway. That Excess was Malta-bound shows us - well, maybe not you, I don't care anymore - that it was not a through-going convoy. "The parts of it that could still move, anyway" - and how many transports/merchantmen did Fliegerkorps X sink? "Excess was a Malta-bound convoy which subsequently moved east from Malta" - Jon, even YOU must see that THAT means it sailed from Gibraltar into the Eastern Med. It doesn't matter if ships were empty or full - they transited where you said they couldn't. No, Jon - YOU are insulting my intelligence and that of anyone else who can count, if you can't see that the two convoys reaching the Eastern Med from the Western Med that were ever sent in your specified timeframe made it to their destination - was two convoys arriving out of two. NOR does it matter if they stopped at Malta or sailed by in the night - nor does it matter what they carried/unloaded where - the point is that they transited the Central Med and disproved your proposition. Jon - I disagree with this being split off as a separate What-If. It is dealing with KNOWN HISTORICAL EVENTS and a statement made by you regarding them. It has ramifications FOR the original What-If thread - but this particular element of the discussion has no place in the What-If section. It would be far better placed in "WW2 in Africa & the Mediterranean". True, as long as we discount the Essex, which was hit and damaged by a bomb before she was unloaded at Valetta. ...as in - on the trip to Malta? No. While unloading. The local dock workers went on strike because of it. See Playfair I, pp 321-323, where you will also find a reference to the Illustrious being hit by bombs while in harbour. Actually, I'd already come across that regarding the SS Essex; there's an account on the Net by veteran of the HMAS Perth who provided firefighting personnel from her complement - she was moored 200 yards behind the Essex when she was hit in the engine room with 17 fatalities. Luckily by that stage she had unloaded her cargo of 4000 tons of ammunition, twelve crated Hurricanes and was down to just schlepping the 3000 tons of seed potatoes. By the way, Jon, do you still hold that EXCESS wasn't a through-convoy to the Eastern Med? phylo_roadking wrote: Actually, I'd already come across that regarding the SS Essex; there's an account on the Net by veteran of the HMAS Perth who provided firefighting personnel from her complement - she was moored 200 yards behind the Essex when she was hit in the engine room with 17 fatalities. Luckily by that stage she had unloaded her cargo of 4000 tons of ammunition, twelve crated Hurricanes and was down to just schlepping the 3000 tons of seed potatoes. You would think that they would have unloaded the potatoes first. Playfair has a somewhat different version. He maintains that a 'heavy' (=probably German) bomb hit and penetrated her decks on the 16th but did not explode, despite a 'large cargo' of ammunition still aboard. The bomb killed 15 crewmen and 7 Maltese stevedores. After that the stevedores refused to continue, and gangs of soldiers and sailors had to take over. Owing to their inexperience, the Essex was not unloaded until the 29th. Well, phylo, I have been trying very hard throughout this discussion to distinguish between Malta-bound convoys and Delta-bound convoys. In that sense, Excess was not a through-convoy to Egypt. Yes, her merchant ships eventually escaped east, but, being empty after they had docked at Malta, they can't really be said to represent through-traffic to the Delta. I've also been careful throughout to mention the Tiger convoy as an exception. Not a wholly succesful one - it did lose a ship - but a through-going convoy regardless. One factor which reduced the need for convoys to Malta in this timeframe was O'Connor's capture of Cyrenaica, which brought North Africa-based aircraft within range of the island. Rommel's April offensive changed that, but by that time Fliegerkorps X was already slated for re-deployment to Greece, its Stuka Gruppen having already left in February - one for North Africa, the other one for Austria. However - still with Tiger representing an exception - through-going convoys to the Delta were not attempted again. The Tiger ships were hand-picked modern 16 knot merchantmen while 'normal' fast convoys could only make 12 knots. Even if Germany still does not do a MED strategy. Once France falls the Paratroopers should have sent to take Malta. The German paratroopers needed to go after Malta and the sooner the better. I asked - "Jon, do you still hold that EXCESS wasn't a through-convoy to the Eastern Med?" January 10th Rejoined Mediterranean Fleet with Force F. Under heavy and sustained dive-bombing attacks by German Fliegerkorps X, west of Malta. (Note : HMS ILLUSTRIOUS was badly damaged in these attacks. See above references). Escorted mercantile ss ESSEX into Malta (One of Gibraltar convoy). 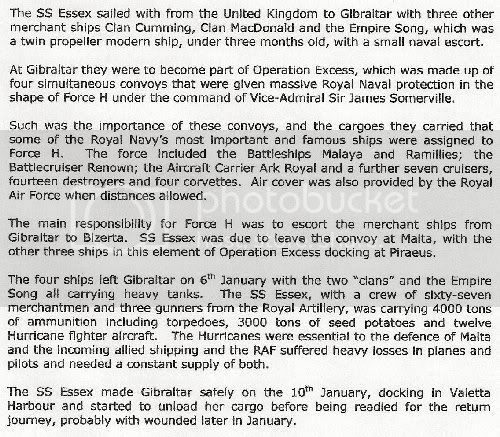 ...it becomes clear that EXCESS was a through-convoy from Gibraltar to the Pireaus - it was just one single cargo ship, the SS Essex, escorted by H.M.S. Hero that BROKE OFF from the main convoy to enter Valetta Malta was the sideshow, the THREE cargoships with tanks heading from Gibraltar to the Pireaus was the main convoy, and it didn't stop at Malta nor enter Valetta. So I am afraid THIS - "Didn't happen. Except for TIGER" - is not correct. During Fliegerkorps X's Sicilian deployment - the Royal Navy escorted TWO convoys of armour THROUGH the Central Mediterranean bound for the Eastern Med; TIGER and EXCESS. Why do you think the Admiralty couldn't refuse Winston when it came to TIGER??? He had the precedent of a successful transit for EXCESS to use against their arguments. Last edited by phylo_roadking on 10 Jun 2009 02:10, edited 4 times in total. Can I suggest you follow this element up in the original thread? This is dealing with the naval war element. Suffice it to say at THIS point - immediately after the Fall of France....the FJ and airlanding divisions had taken MANY casualties in Norway and Holland, were short on serviceable aircraft in June 1940, were short of parachute silk, and had almost no gliders. They had ALSO severely blotted their reputations by the many expensive near-failures in Norway and Holland when their tactics for taking airfields and air bridgeheads proved to be VERY costly. One of the reasons why Student was able to press the idea of the assault on Crete was they managed to restore their reputation somewhat with the successful operations they carried out in mainland Greece as part of Operation Marita.